I would be very grateful to anyone who can tell me the sort of tools and techniques used in the Georgian period to engrave crests and monograms on flatware. I have searched the internet and libraries but have had no luck. I would also like to know where I might find such tools. The bright cut engraving and the crests etc. were done using freehand gravers in Georgian times. You can buy the gravers new from Cookson or Walsh, among others, but I find that old ones hold their edge far better, and you can sometimes get these in antique shops or on eBay (but they are quite sought after there.) You often get them in bunches, if you are lucky, you can select the ones you want and put theothers on eBay and recover your outlay. Modern ones are also on eBay. There is a good book "Engraving on Precious Metals" by Brittain & Morton, N.A.G. Press which goes through all the lettering, shields and heraldric and ornamental engraving. 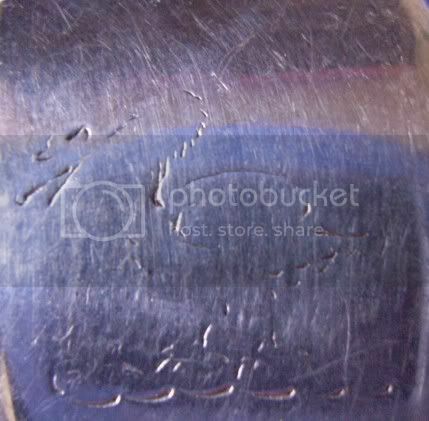 It also covers machine engraving. I can't tell you how grateful I am to you Richard. Do you engrave yourself? If so, could you advise me as to which graver sizes would be most useful for touching up spoon crests? Are you planning on "touching up" the engraving on Georgian silver? Is that common in the U.K.? I do engrave a little, but I am still on the learning curve. It is not as easy as all that, believe me. I would advise practising on some scrap pieces before you go near anything good. HS Walsh stocks gravers, the handles and the book. One problem is that you need to bend the shank and break the actual blade to the length required for your hand. As I said, it is better to get old ones if possible, as they are already shaped, admittedly to someone else's hand, but for a starter, and someone who is not going to be using them all the time for your actual breadwinning, that is fine. Put engraving tools on eBay as your favourites, then, when they come up you will be alerted. I got some there, some in a local antique place, selected the ones I wanted, and put the rest on eBay again, ended not paying much. I had a look on eBay last night, and Murphy's Law, there are none at present. 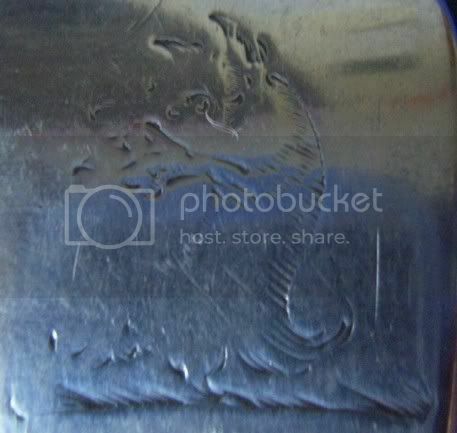 For engraving crests you need the knife type, fairly fine to medium 2 or 3 sizes for various lines. You might also need a shading (multi-line) graver. I would advise looking round bootfairs etc to get one or two to practise with. You will also need an oil stone or carborundum stone for keeping the edge on the graver sharp. Read and practice, and eventually enjoy. Thanks Richard; I have already demanded the book for my Birthday, and I'll try both antique and modern gravers. Cheryl, I sensed a spot of disapproval in your post. I only plan to work on my personal flatware where the crests are unattractively worn like these two forks. I have no intention of tampering with the decorative engraving on anything. I'd say that the left hand one is not worth touching up, unless you have a perfect example of the crest. If it's not your own family crest, is it worth it? If you want it to have a crest, and you want to do it yourself, design your crest. then practice the design on some copper sheet, then try on some scrap flatware, where you can rub out with a file and sandpaper and try again. Then do the real piece. You can always keep the trial pieces as a conversation piece. I think it is most certainly worth it: I am building up a canteen of crested Old English flatware, and it always saddens (and annoys) me when I have to reject a piece because its crest has almost worn away. I also enjoy the designs and, perhaps with more sentimentality than rationality, appreciate the history that goes with them. No disapproval, just curiosity. Not something that I've ever known anyone to do, have dealt with antiques for many years and seen different types of repairs and restorations done on all sorts of items. Honestly just wondered if touching up engraving is commonly done. Re: Information on engraving wanted. My favorite subject discussed at length ! I have been wanting to learn to engrave for years but not looked into it seriously for lack of time. Now I may just have to find the tools suggested here and the book and learn. I had intended to practise if I ever found the proper tools on scrap silverware first of course, but could never find anyone who would share info about the subject. Welcome to the forum and good to read you have found useful information.